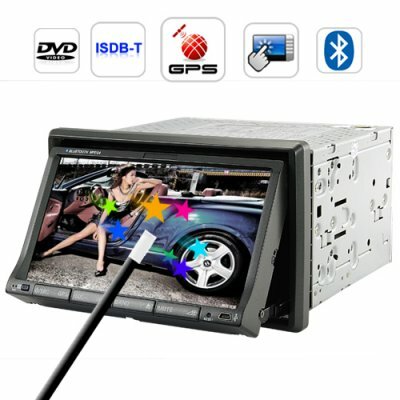 Successfully Added Carnaval 7 Inch Touchscreen Car DVD Player with GPS and ISDB-T to your Shopping Cart. Finally, what you’ve been waiting for. A top of the line 2-DIN region free car DVD player with built in GPS navigator and ISDB-T digital TV receiver! Hello Brazil, Japan, Argentina, Chile, Venezuela, Ecuador, and Peru…The Carnaval is for you! Each week we get hundreds of requests from our South American fans. “When are you going to start selling a ISDB-T and GPS double DIN dvd para carro? !” Sorry it took so long, but we needed time to find the perfect system which combines quality with affordability and finally here it is: The Carnaval 7 Inch Touchscreen Car DVD Player with GPS and ISDB-T. Everything you’ve ever wanted for your car and more! What are you waiting for? Be Smart and Add to Cart. Pick up one of these amazing ISDB-T 2-DIN (100 mm high) dvd para carros with GPS and multimedia functionality before they’re out of stock or better yet, start listing them on your online store. This incredible car DVD player and many others like it are brought to you by the online leader in wholesale direct from China electronics – Chinavasion. NOTE: ISDB-T digital TV receivers only work in the following countries: Brazil, Japan, Argentina, Chile, Venezuela, Ecuador, and Peru. Se você está procurando um DVD que recebe sinal de TV digital ISDB-T, esse produto é pra você! GPS software and maps are easy to find on the web. Search for them on Bit Torrent and other file sharing sites. Once you’ve got them on your computer, copy them onto a flash memory card and then load it into The Carnaval’s SD slot. The system itself will do the rest! A lot of work has been put into making this user manual user friendly. The thing is though, this car DVD system is very intuitive so we're pretty sure you probably won't even need to read the user manual. While the main menu system does not support the Greek language, the ISDB-T system does however support the Greek language. What's more, if your GPS software comes in Greek then the GPS "Voice" and "Text" will be in Greek. Most popular GPS software titles come in a variety of languages. As for media playback with Greek subtitles, we suggest you download free software from the web to hardsub your Greek subtitles to your AVI files for video playback. You guys have terrible spelling. It's Carnival, not Carnaval! On the contrary, "carnaval" is Portuguese for "carnival".